Jönköping (A) experienced a bad thunder storm overnight/this morning. Not only was part of the city flooded, my joints did not like it either… I woke up with pain and it just got worse and worse. Not even a hot shower helped! I wanted to stay in bed but obviously couldn’t do that… had to eat breakfast and check out. We started driving along the western side of Lake Vättern. In Hjo (B) my father-in-law wanted to take a walk in the city park and my hubby joined him. I sat in the car… while waiting I read the newspaper online and saw that the highway in Jönköping had been flooded and was closed! Perfect that we decided on the other route around the lake as we had no issues at all! My hurting joint didn’t give in (even with the two painkillers I took in the morning). It hurt so bad that I was nauseous and really wished I was somewhere else than in a car. Eventually hubby convinced me to take a 1/2 cortisone pill in addition to what I already took in the morning. I really don’t like that I needed to raise the dosage but I just have to get used to it I suppose. My joints, the weather and the cortisone dose don’t cooperate all the time. 😢 I need to stop being so stubborn in regards to my cortisone pills. Thankfully the grey and colder weather have disappeared when we drove from Jönköping and the more north we got the warmer it got. 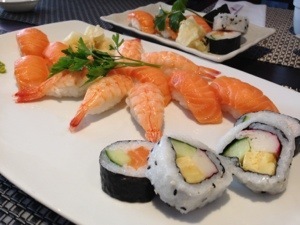 When we arrived in Linköping (C) it wasn’t as many joints hurting anymore and I could enjoy a nice lunch at my favorite sushi place! 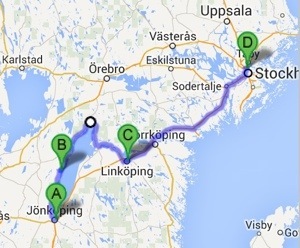 From Linköping we drove directly to Stockholm (D), left my father-in-law at the train station before heading home. Now we have unpacked a little, gone grocery shopping, and eaten grilled chicken and potato salad on the balcony. 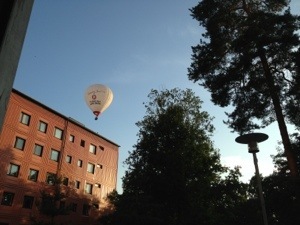 While sitting on the balcony a familiar sound appeared which made my look up trying to find a hot air balloon. It showed up right above our next door condo building. I’m not completely without pain still but it’s much better now. I really dislike thunder storms! It make my joints hurt so bad! 😡 Only positive thing is that a thunder storm passes quickly so that means only a few hours feeling bad compared to days with a regular rain storm.